Hard Metal and UOP have a unique partnership that has driven the growth of the brand throughout Ireland. Based in Brescia, northern Italy, UOP’s manufacturing and coating facilities produce quality, innovative products from standard HSS & Carbide cutters to patented geometry industry specific cutting tools. Our close friendship with our UOP colleagues and regular visits to Brescia allow us access to new technologies, product development and testing, and efficient, reliable logistics. 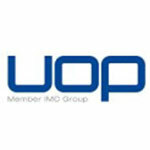 Company profile UOP has been part of the IMC group since 2003. The standard range of UOP tools includes Endmills, Drills, Reamers and Core Drills in Solid Carbide and Endmills, Milling Cutters, Reamers, Core Drills, Countersinks, Taper Endmills, Form Tools and Miscellaneous Tools in powder metal and HSS-E. An advanced and efficient logistics team ensure accurate next-day deliveries throughout Europe. A major UOP strength is their ability and accuracy in the design and manufacture of special tools. A dedicated team of engineers provide detailed drawings with short turnaround, and an efficient production process allows quick and accurate delivery predictions. Close collaboration with UOP has allowed Hard Metal develop & deliver special tools driving innovation and CPU savings across multiple industry sectors including aerospace, medical and general engineering.